When one thinks of a savannah the image that comes to mind is one typically representative of Africa—a vast never ending grassland inhabited only by a lonely Acacia tree on a distant horizon. This is precisely the image that scientists from National Centre for Biological Sciences (NCBS), Bangalore and Center for Integrative Conservation, Xishuangbanna Tropical Botanical Garden, Yunnan, China would like to change. In a study recently published in Philosophical Transactions B, the scientists allege that savannah biomes in Asia are unrecognised as distinct ecosystems. As a consequence savannahs biomes are both misunderstood and mismanaged. Some reasons for such ignorance stem from the biogeography and history of the southern and south-east Asian region. A simple definition of savannah would be a tree-grass ecosystem where tree canopy is discontinuous with a nearly-continuous understorey of grass. Such ecosystems can encompass deciduous broadleaf savannahs like the teak forests of South India, deciduous fine-leafed and spiny savannahs such as those found in Gujarat or the Sariska Tiger Reserve, Rajasthan and evergreen pine savannahs, commonly found in the Himalayan foothills. The type of forest varies with the amount of rainfall an area receives. When an ecosystem has trees, it is very common that the grass goes unnoticed. However, grass is the critical component which drives the functional ecology of these ecosystems. The biogeographical accident is that in contrast to Africa which has drier savannahs, the Asian savannahs tend to occur in places which have relatively higher rainfall. Hence the Indian subcontinent has savannahs that are more densely wooded and are commonly mistaken as degraded forests. This misunderstanding is largely a colonial hangover that has unfortunately persisted in the scientific community and the forest departments involved in the management of grasslands. The British were foresters whose focus was on trees—they were looking for timber to extract. Hence they classified any vegetation with tree cover as forests. In the past, scientists (and others) have argued that savannahs resulted from human settlement and management. This study, however, refutes this theory by presenting different sources of evidence that indicate the presence of savannahs before human arrival in the area. The researchers also suggest that the ecosystem may have encompassed larger areas under climatic conditions of the past. Their theory draws further support from fossil and molecular evidence, which show that savannahs and herbivores adapted to savannahs existed as far back as 1 million years ago (1 Ma). The herbivores—distinct species of deer and ruminants like gaur and antelopes—play an important role in maintaining the savannahs as they feed on different layers of grass. On the other hand, humans started to use fire as a means to modify landscapes for agriculture only about 0.12 Ma. As part of the study the researchers also mapped the potential extent of Asian savannahs. 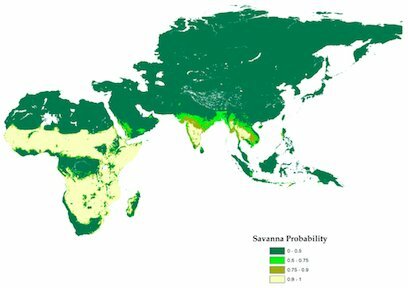 Although savannahs everywhere are structurally similar, their geographical distributions vary with climate across continents. As there is insufficient data to identify the geographical extent of Asian savannahs, the scientists constructed the maps based on an analysis of climactic conditions of savannahs from different continents—Africa, Australia and South America. They found that with African climactic conditions, Asia would support the largest area of savannahs by far. The areas mapped (as savannahs) under these conditions also are the closest match for known Asian deciduous savannahs. Lastly, and most importantly, the study makes a case for savannahs to be recognised as unique ecosystems. This understanding is critical for conservation and management practices. Jayashree Ratnam, the lead author of the study argues that, “complete exclusion of fire and herbivory are not right management policies for these ecosystems,” and suggests that these should be used as tools to manage the savannahs effectively. Inappropriate management of fire and herbivory, land-use conversions to agriculture, afforestation and invasions by exotic species, along with climate change will have large impacts on the structure and dynamics of Asian savannahs in the decades to come.